Located in the centre of eastern Berlin, St Christopher's Inn Berlin offers simple accommodation in the trendy district of Mitte. Free Wi-Fi is available throughout the building. 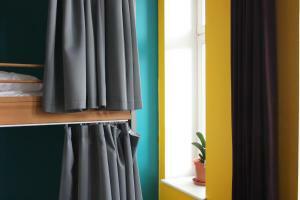 All rooms at St Christopher's Inn Berlin are designed using bright colours and are furnished in functional style. They include a desk, and have access to shared bathroom facilities. The hostel is just 800 metres from Alexanderplatz Square, and attractions such as the Brandenburg Gate and Checkpoint Charlie can be reached with a 20-minute journey on public transport. A continental breakfast is available daily at St Christopher's Berlin and the Belushi’s Bar offers guests a discount on food and drinks. St Christopher's Inn Berlin is located across the street from the southern exit from Rosa Luxemburg Platz Underground Train Station, and 3.5 km from Berlin Central Station. Bed linen is included in the price and towels can be rented for a small fee. Guests are required to show a photo identification in the form of passport or European identity card. Guests under 18 years of age can only be accommodated in private rooms, and not in dormitories. There is no capacity for extra beds in the rooms. Bright room furnished in functional style which includes a desk and access to a shared bathroom. Bright room furnished in functional style which includes a desk and access to a shared bathroom . Set in a 2-bedroom shared apartment, this double room features a modern, homelike design. It includes a shared kitchenette as well as a shared bathroom. Set in a 2-bedroom shared apartment, this twin room features a modern, homelike design. It includes a shared kitchenette as well as a shared bathroom. This is a private dormitory for up to 8 adults with access to shared bathrooms. This is a private dormitory for up to 6 adults with access to shared bathrooms. This private apartment with 1 twin bedroom and 1 double bedroom has a kitchenette and private bathroom. Bed in 2-Bed Female Dormitory Room.